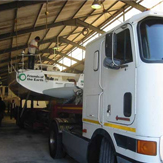 Our boat transporters are commercially licensed, appropriately insured, use escorts when required and have the utmost awareness in transporting you boat in a safe and caring way. We are equipped a with custom designed trucks and a state of the art hydrolic trailers that ensures a smooth safe ride where ever your boat needs to go. We provide exceptional service and our pricing is very competitive. We can transport your boat locally and nationwide.